Jose Mourinho sacked: What next for the former Chelsea manager? Chelsea have sacked Jose Mourinho just seven months after he brought the Premier League title to Stamford Bridge. The 52-year-old Portuguese has had a career of almost unbroken success, including two titles in his first spell at Chelsea, Champions League wins at Porto and Inter Milan as well as La Liga glory at Real Madrid. 'The Special One' is on his way out after a remarkable decline that saw reigning champions Chelsea plummet to just one point off the relegation places - so where will he go next? Mourinho was linked with Manchester United when Sir Alex Ferguson retired in 2013 and has rarely spoken in anything other than glowing terms about the Old Trafford club - leading to speculation he would relish the job at some stage. United manager Louis van Gaal is struggling to win over a sceptical public unhappy with his playing style and his team's recent exit from the Champions League. If Van Gaal fails to improve matters and Mourinho is available at the end of the season, could he be the perfect replacement? Mourinho's style is equally pragmatic but he is a guarantee of success, charismatic and would not be afraid of United's worldwide stature. Did Jose hoodwink the media? Where did it go wrong? Rafael Benitez, an old adversary of Mourinho, is in charge at the Bernabeu but he too has faced criticism of his tactical approach. His cause was not helped by the 4-0 El Clasico thrashing by Barcelona and the loss to Villarreal that has put Real off the pace in La Liga and the former Liverpool and Chelsea boss under pressure. Could Mourinho return to Real? He left amid squad acrimony in 2013 but president Florentino Perez remains an admirer and it may be a case of Mourinho feeling he has unfinished business if he ever had the chance to go back. Managerial positions are always fluid at the Bernabeu - so it is a case of "never say never". Mourinho has won titles in the Premier League, La Liga and Serie A but Bundesliga success is missing from his CV - and only one club could meet that need. Bayern Munich may soon find themselves having to fill a Pep Guardiola-sized hole at the Allianz Arena, and few managers in football have the pedigree and personality to match the demands and expectations of a club known as 'FC Hollywood'. Mourinho is one, and his sudden availability may spark interest from Bayern, though this job looks like it has got Carlo Ancelotti's name on it. Mourinho has always stated his intention to sample international coaching later in his career - with all the signs pointing to him eventually taking charge of his home country, Portugal. Mourinho was right in the frame to succeed Steve McClaren in 2007 but eventually pulled out of contention. Would the Football Association be tempted to make an approach if Euro 2016 does not go to plan and Roy Hodgson's time is up? It is an unlikely scenario but if England were seeking a new manager and Mourinho was available, surely the call has to be made? Unlikely - but an interesting thought. Could it be that Mourinho's abrasive, confrontational style means he is shunned by the big clubs who simply feel his style brings a level of trouble that outweighs the trophies? No chance. Managers who win trophies - and win them with the regularity Mourinho does - will always be in huge demand. He will probably be fielding calls within days. Who can lift Chelsea's Blues? 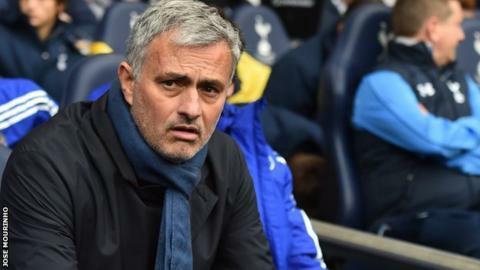 Read more on Jose Mourinho sacked: Who will Chelsea turn to next? Why did it go wrong for Mourinho?